Dr.Malpani's Blog: Wht can't the Indian government make up its mind about commercial surrogacy ? Wht can't the Indian government make up its mind about commercial surrogacy ? The ICMR ART Bill has been in the pipeline now for over a decade. It was crafted by the Ministry of Health and Family Welfare in order to regulate the practice of IVF and surrogacy. It laid down clear guidelines , to ensure that commercial surrogacy would be practised ethically by IVF clinics in India. It was polished over many years, and inputs were sought from doctors as well as members of society at large . Public hearings and debates were held, to ensure that infertile couples and surrogates would be protected. To my surprise and dismay, the Dept of Health is now singing a completely different tune. 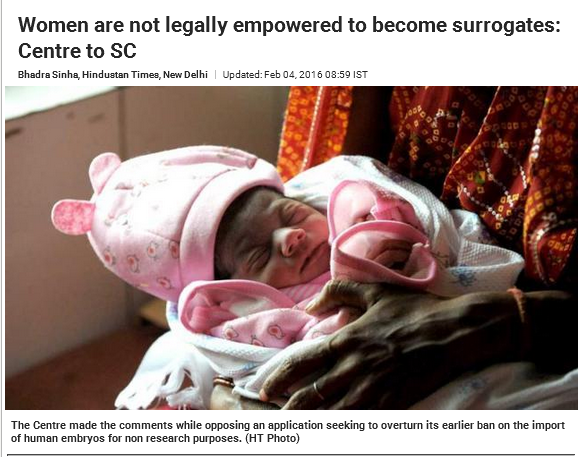 They have filed an affidavit in the Supreme Court ( which is hearing a PIL seeking a ban on surrogacy) and are now saying that commercial surrogacy should be banned !